I was in a Toys “R” Us yesterday and spotted some cool tech that, until now (at least as far as I’m aware), was only available in Europe. I found a digital camera, a camcorder, an Mp3 player, night-vision binoculars, and a helmet camera. Check out the vid below for full coverage. Hey guys, so today I edited this little piece together. It’s my first range demo but I think it turned out pretty good. Tell me watcha think! For those of you who haven’t gotten yourself a Rampage yet, and for those who haven’t seen an unboxing… umm, I made one! Hopefully the below video will stand out as a bit higher quality than what you may have come to expect from unboxings. I hope you enjoy and would love any feedback, so tell me watcha think! Hey guys! So in case you didn’t know, I’ve been doing a lot of stuff in the background for the past month when I’ve had the chance, and I’ve just launched my new YouTube channel, ShiningFoam. The reason I made it is because I am now a product tester for NERF. I’ve already gotten my first package and am busily editing unboxings now. I have TONS of footage to sort through, but for now, I have five videos on the new channel. Here’s the Nerf Package Unboxing one. Hope you like it! Also, the rules said that I wasn’t allowed to publicize them until after the contest was over, but here is the rough draft and final version of my submission, “Time for Battle”. Hope you enjoy them; tell me what you think! My affiliate AwsomelyNerf contacted me earlier this morning with some great information. AN is down in Singapore, and has gotten a sneak peak of the new N-Strike Elite Pinpoint Sight by means of a guide book distributed out at local toy stores. The stores have been having “Elite tryout” games and he managed to get the pamphlet there. 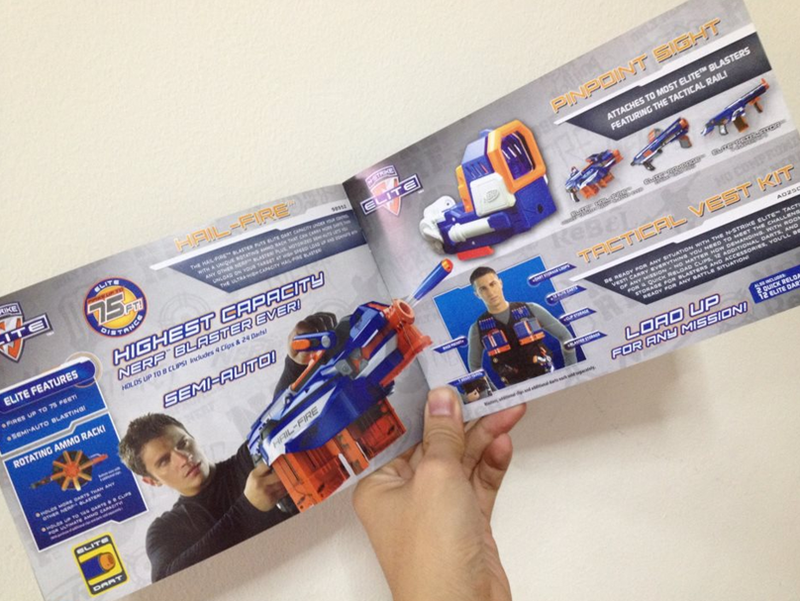 Apparently they have also been handed out at the 2012 Malaysian Nerf Dart Tag Tournament as well. Grab a locked, loaded, and ready to fire Retaliator. Aim at two rows of targets. Four targets on top, worth 5 points each, Four targets on bottom, worth 2 points each. Fire. Hitting the targets earns you points. If you earn enough, you win a Nerf prize. No word yet on how exactly the sight functions (It may work exactly the same as the N-Strike version or it may be better) but man it looks cool! Thanks AN for the info!